This designed tree gives the holiday a modern day look to celebrate the fun filled season. 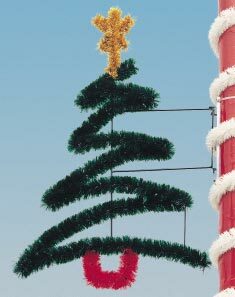 Its "zig-zag" design will really stand out among your pole mounted Christmas decorations. Featuring the bright green garland, this tree will provide years of service in your pole mounted Christmas display.